One mile run/walk to benefit the Sullivan County Humane Society. The Santa Special AniMile & Human Race is the Humane Society’s largest fundraiser to help fund the spay/neuter program. Run or walk a mile with your pet. All pets are welcome as long as they are on a leash. Don’t have a pet? 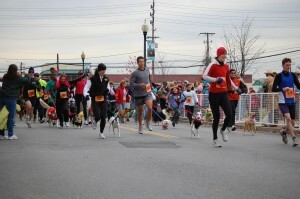 Run in the Human Race-1 mile that also benefits the Humane Society of Sullivan County. To download a printable entry form click here. For a course map of the 1-mile course, click here. Very excited to announce that we presented the Sullivan County Humane Society a check for $3,000 from Santa Special AniMile in 2012! Thanks to all who supported our race and helped us make this donation!